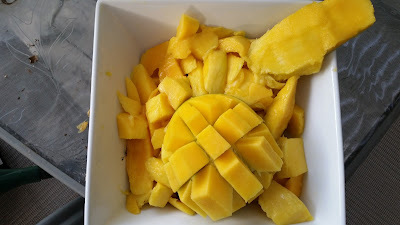 My mango stash is ripening fast, so down the hatch! Mangoes are a staple for me, so I buy a lot each week. Tonight I made a mono-meal of 5 huge Keitt Mangoes. So smooth that they practically melt in your mouth. If I don't want to mono-meal mangoes I may add some cucumber, cherry or grape tomatoes, and drizzle lime on top . This is one of my favorite meals. Depending on the size, one mango is 100 calories or a bit over. For the most part I know how many calories are in the fruits and vegetables I consume which makes calculations easier. On the 80/10/10 low fat, high carb, raw vegan diet (that's a mouth full, and very eye roll worthy), I typically consume anywhere between 1500 - 2000 a day, depending on how active I am. The more ballet, swing dancing, and dance cardio, I do on any given day, the more I need to eat. Fruit is fuel.